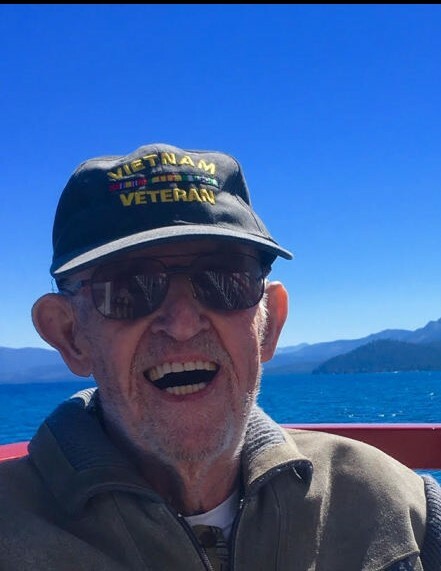 Obituary for Clyde John Russell | Sierra View Funeral Chapel & Crematory, Inc.
Rusty passed away peacefully on Friday Jan 18 at home on hospice care surrounded by his family. He was diagnosed with Azheimers in August. Since then he was cared for by his wife Patricia, a live-in caregiver called Ram Singh, and his three surviving daughters. Rusty had a very interesting life. He was born and raised in Corsicana Texas. He ran away from home at age 13 an began a life of adventure. WWII was going strong and the merchant marines accepted him with a forged birth certificate. He saw action at the Guadacanal, some Pacific Islands, and the Philippines. When the war was over, he joined the U.S. Navy for a brief stint and was stationed at Dallas Naval Air Station in Texas where he met and married Patricia in 1950. He left school in the 5th grade but over the years, through hard work and correspondence courses, he attained an AA degree in Humanities. Going into the U.S. Army in 1950, he rose to the rank of Command Sergeant Major before he retired in 1975. He felt education was very important, and put his four daughters through college, where they all earned BA degrees. Rusty enjoyed gambling and was a high roller at Harrah’s at Tahoe for many years. He played “twenty one” and was an astute card counter. He knew every scam in the book. He treated his family to concerts and lobster dinners “comped” by casinos many times. He was a flirtatious and charming man, and always had his “pick of the day”, a pretty girl who was the object of his admiration. He would stop this young woman and explain that she was his “pick of the day” but he would show a photo or gesture to Patricia and remark that she was his wife and the “pick of his life”. We had our ups and down as all couples do, but we loved each other well for over 68 years. There were times in our marriage when he drank too much, or played cards with his buddies too late. But, he always made it to work on time in a freshly ironed uniform and always got up on Sunday mornings with his wife and daughters to attend mass. Retirement rolled around in 1975 at age 45 after 30 years of active duty service, (his under age service was counted!) So, there was no more work or business ventures for Rusty unless you count playing blackjack at Harrahs! We loved to travel and made use of Space Available travel on Air Force cargo planes and saw the world. For over two decades we kept a VW camper in Europe with two small bicycles. From April to September we traveled around Europe and the Middle East. In between we visited Hawaii where we had positioned another VW camper. We loved traveling in Australia as well and frequently caught a hop from Hawaii to “down under” where we usually rented a camper to explore one of our favorite travel destinations. Later on, we were down to one motor home, a Toyota Dolphin, which we used to explore the united states to visit friends and family. When our health dictated travel more conducive to old age we switched to cruising. Cruise ships were never our “cup of tea” but we saw some beautiful places along the way. All guests did was eat and drink! We wanted to see the culture various countries had to offer and missed “roughing it” and just wanted a bologna sandwich! Did I say Rusty was perfect? No, but he was a joy to be with and always had a solution for everything! He was well loved by his wife of 68 years Patricia(Crossland) Russell, his daughters Ruthann Russell, Diane (Russell) Celazure (who passed away in 2014,),Marianne (Russell) Reagan and Suzanne(Russell) Miller, (“god’s little bonus”). He had 8 grandchildren and two great grand children with a third great grandson soon arriving.